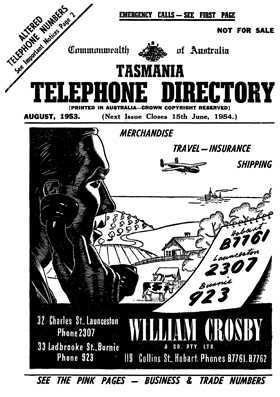 This directory covers all of Tasmania and includes separate sections on Hobart, Launceston and country exchanges. It lists thousands of telephone numbers for 1953 arranged in a similar way to today's telephone books. Each section includes a list of people and companies together with their address and telephone number and are sorted alphabetically. The country section is sorted alphabetically by town. It also has separate business and government departments sections. It also includes call rates for both local and interstate calls, telegram rates, how to place a call or telegram using different phone types, postal rates, wireless licence information and general telephone information. This directory is a useful genealogy resource giving extra insight into the lives of those living in this era, and great for anyone exploring their family history or building a family tree.